This vibrant collection features one dozen antique roses. 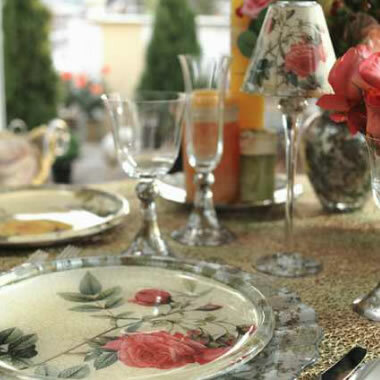 Each pattern is shown on a richly unique array of dinnerware and entertaining accessories for the home. Colors range from the palest white and prettiest pink, to the sunniest yellows, scarlet reds and the dramatic Blood Red China Rose. Imagine as you wander down a secret pathway, the air filled with the intoxication fragrances of rare Gallicas, Centifolias, Albas and other historic roses too long neglected by the world. These rare and now coveted roses are celebrated in this romantic collection. Whether found in a cottage or a palace garden, roses are an ancient link to our past heritage and have quietly endured for thousands of years. There is a renewed interest in these heirloom roses, and Lesley, in keeping with her love of the old world, has again mastered the mix of old and new. The roses, with her signature crackle, plus the silver and bronze "antique mirror finish", all combine to create a work of art.